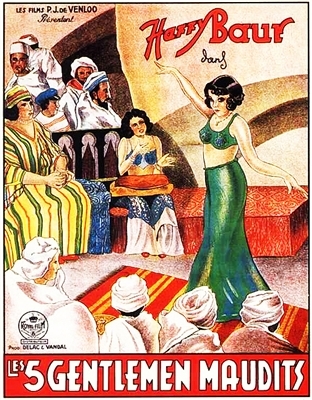 This film was released in the US with the title, "Moon Over Morocco." Les Cinq Gentlemen Maudits (The Five Accursed Gentlemen), Julien Duvivier's second talkie, was also the second in a series of five box-office hits for the prolific director. The scene is Morocco, where a local soothsayer predicts the death of five men. After three of the "cursed" quintet die under mysterious circumstances, the focus shifts on the fourth, millionaire Harry Baur. It is up to wealthy young Rene Lefevbre, the boyfriend of Baur's niece Rosine Derean, to save his future uncle-in-law from harm -- and to sift out the truth behind the three previous deaths.